The research lifecycle is a long and complex process. It includes multiple phases—from planning to project management to publishing. Within each phase, there are lots of disparate tasks that need to be performed. The planning phase alone, for example, includes everything from scientific literature search and acquisition to reference management to ethics and compliance. What’s more, the lifecycle phases are rarely distinct. Indeed, they often overlap and spiral back around. Unfortunately, there’s no one-size-fits-all solution that can simplify the research lifecycle for everyone—because every project is unique, and every researcher works in his or her own way. Wouldn’t it be nice, though, if researchers could take control of their own research workflows? What if each researcher had a truly customized set of science tools, designed to streamline and enhance their research? Think, for example, how much faster scientists could work if they could customize their workflows—so they no longer had to toggle back and forth among dozens of open web browsers; break focus to find a specific lab tool; or spend an inordinate amount of time trying to access full-text scholarly journal articles. The good news is, they can. The latest addition to Article Galaxy, the Gadget Store makes Reprints Desks’ research platform available to individual researchers for the first time. Similar to an app store, it lets you search a vast library of science apps (called Gadgets) and add them to your personal Gadget dashboard. You can then configure your dashboard of Gadgets in a way that best fits your workflow (e.g. move Gadgets among three screens, keep groups of Gadgets together that you might typically use in direct sequence, etc). In short, it provides a single research platform from which you can access all the varied tools you need to perform your research—so you never have to leave your workflow to perform a particular task. Even better? Anyone can use the Gadget Store for free. In fact, Reprints Desk actually requires that users sign up for a free Gadget Store account before deciding whether to upgrade to a paid account. 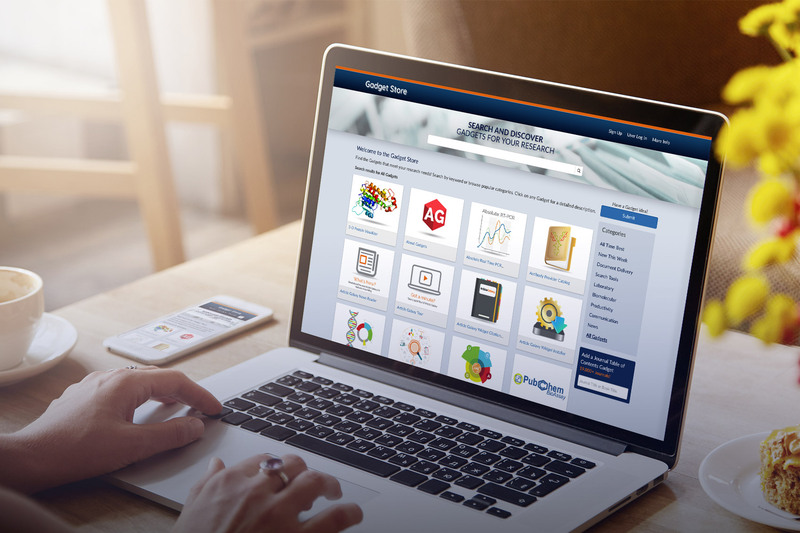 Document Delivery*: Access full-text scholarly journal articles and book chapters on demand, 24/7. Reference Manager: Leverage all the best reference management tools, plus integrated scientific literature search engines and on-demand order options. PubMed Searcher: Search PubMed conveniently within the ‘Gadgetsphere’ (and use those search results seamlessly within other Gadgets). Journal Table of Contents: Subscribe to the TOC feeds of scientific journals. 3-D Protein Visualizer: Collect all the protein structures mentioned in PubMed papers, and explore them in a 3-D visualizer. Trending Articles Finder: Gain insight into the most popular online scholarly journal articles, based on Altimetric scores. Products in the News Finder: Get up-to-the-minute industry and competitive insights. Lab Supply Tracker: Keep track of lab supply inventory levels. Scientific Calculator: Speed up your research tasks by eliminating the need for a separate calculator. Open Access Finder: Determine if an Open Access version of a particular citation is available, then navigate to it without the need for separate, time-consuming searches. *What Is a Document Delivery Service . . . And Why Does It Matter? What image comes to mind when you hear the term “document delivery service” in relation to scientific research? In the past, most people likely envisioned a courier or postal carrier, hand-delivering a hard-copy document to their door. But like so many things in the digital age, the Internet has changed the way researchers obtain scientific literature. Now, with a modern document delivery service, like Article Galaxy, researchers can get fast—and often instant—web-based access to the scientific content they need, including PDFs of scholarly journal articles, books and book chapters, patents, and more. If you’d like to explore the Gadget Store, sign up for your free account now. You’ll get immediate access to eight research Gadgets. Give it a try and see what you think!